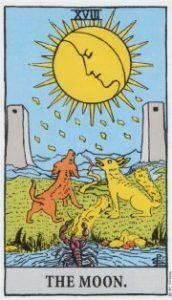 From the Rider-Waite Tarot published by US Games Inc.
Life is challenging and it’s easy to get stuck in old patterns that block your success. Tarot is a powerful tool for identifying these hurdles and guiding you to be your most powerful self. In this master class which runs for an hour and 40 minutes, Katrina takes you through the Major Arcana cards to explore the hidden challenge and test within each trump. Then, she does an about-face and shines a light on each card’s greatest gifts. For example, what happens when you spell “Devil” backwards? What does that say about the core of this card’s message to the world? Whether you’re new to Tarot or an experienced reader, you’ll benefit from this class which comes with a range of handouts. No counseling skills are necessary to appreciate the information Katrina presents. Katrina Wynne, M.A. is an international metaphysical teacher, trained psychotherapist, and soulful counselor. She has studied Tarot and other metaphysical traditions for over 40 years and has taught around the world. 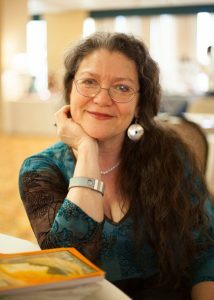 Katrina is pictured here at the Northwest Tarot Symposium in 2015 (photo by Theresa Pridemore). Click here to browse the many wonderful classes she has recorded for Global Spiritual Studies. The video recording of the class is available in two parts as Windows Media files (.wmv). They can be viewed on PCs using Windows Media Player and on Macs using the free VLC multimedia player for Mac operating systems which can be downloaded here.